SITUATED AT THE edge of the Phoenix Park is The Hole in the Wall, one of Dublin’s most renowned watering holes. The building dates back to the seventeenth century and was historically used as both a coaching station and a tavern. The name refers to the days when soldiers stationed in McKee Barracks near Phoenix Park used to sneak off to the bar for a clandestine pint. “They were served drinks through the hole in the wall into the park,” explains the pub’s current owner Martin McCaffrey. McCaffrey has been involved in the pub for over thirty years, having dabbled in other pubs around Dublin 7 for a period. Since then he has fully immersed himself in The Hole In The Wall, overseeing its rapid expansion. At over one hundred metres long, it is said to be the longest bar in Europe. The space is now home to a pub, a restaurant, a coffee shop and a wine shop. McCaffrey says he has made a concerted effort to keep up with modern trends while clinging on to the pub’s unique charms. Some of the trends it has embraced? They have collaborated with Rascals Brewing Co. to create their own house beer known as The Holer. There are plans afoot to launch their own gin early next year and they will soon be serving woodfired pizza in the pub. It’s the type of pub that attracts people from all walks of life – locals, tourists, celebrities. Patrons over the last few weeks have included the All Blacks and former Taoiseach Bertie Ahern. What McCaffrey really values, however, is the fact that The Hole in the Wall has become what he describes as “a real community pub”. Indeed it has its own 256 member-strong running club, a cycling club and a wine club. “It’s a very special thing,” he says. #Day1 #20DaysGiveaway #20days20pictures . Prize: €20 Voucher for The Hole In The Wall . *Winner announced at 10pm tonight* . Head over to our facebook page to find out how to enter. The pub really comes into its own at this time of year. Every year, it is transformed into a winter wonderland with the exterior and interior decked out in twinkling lights, tinsel, miniature Santas and whatever else you’re having. Over the course of the Christmas season, the pub plays host to countless Christmas-themed events like breakfast with Santa Claus or a wine and craft fair. Proceeds from these events are donated to local charities like St Vincent’s on Navan Road and Temple Street Hospital. It’s just their way of giving back to the local community, says McCaffrey. For instance, he explains how the annual craft fair raised over €3,000 for St Vincent’s on the Navan Road. The way McCaffrey sees it, it’s the least they can do. We’re just lucky to have the opportunity to run it and the energy to think up mad ideas all the time. 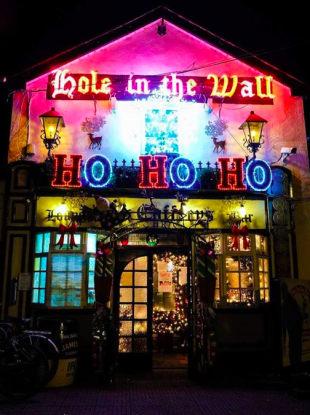 Email “'It takes a month to put them up': The story of the Hole in the Wall's legendary Christmas decorations”. Feedback on “'It takes a month to put them up': The story of the Hole in the Wall's legendary Christmas decorations”.